بصیری پارسا, جلال, رضایی وحیدیان, هادی, سلیمانی, علی‌رضا. (1394). فرایند تصفیه پساب سنتزی حاوی رنگزای AB14 به روش اکسایش الکتریکی در راکتور آزمایشگاهی و پایلوت. مجله آب و فاضلاب, 26(6), 92-99. جلال بصیری پارسا; هادی رضایی وحیدیان; علی‌رضا سلیمانی. "فرایند تصفیه پساب سنتزی حاوی رنگزای AB14 به روش اکسایش الکتریکی در راکتور آزمایشگاهی و پایلوت". مجله آب و فاضلاب, 26, 6, 1394, 92-99. بصیری پارسا, جلال, رضایی وحیدیان, هادی, سلیمانی, علی‌رضا. (1394). 'فرایند تصفیه پساب سنتزی حاوی رنگزای AB14 به روش اکسایش الکتریکی در راکتور آزمایشگاهی و پایلوت', مجله آب و فاضلاب, 26(6), pp. 92-99. بصیری پارسا, جلال, رضایی وحیدیان, هادی, سلیمانی, علی‌رضا. فرایند تصفیه پساب سنتزی حاوی رنگزای AB14 به روش اکسایش الکتریکی در راکتور آزمایشگاهی و پایلوت. 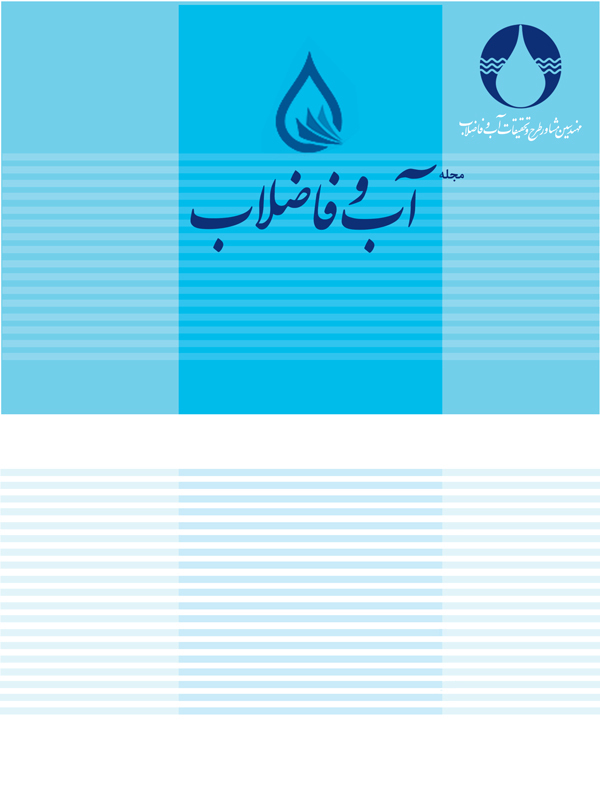 مجله آب و فاضلاب, 1394; 26(6): 92-99. در این تحقیق از فرایند اکسایش الکتریکی در دو راکتور آزمایشگاهی و پایلوت برای حذف رنگ اسید قهوه‌ای 14 استفاده شد. راکتور آزمایشگاهی با حجم 5/0 لیتر مجهز به الکترود پلاتین به‌عنوان آند و الکترود استیل 304 به‌عنوان کاتد بوده و راکتور پایلوت با حجم 9 لیتر مجهز به الکترود استیل 304 به‌عنوان کاتد و آند بود. در این فرایند پارامترهای انرژی مصرفی و بازده آندی بررسی شدند. در راکتور آزمایشگاهی بعد از 18 دقیقه از انجام فرایند حذف رنگ و COD به‌ترتیب برابر 92 درصد و 36 درصد بوده و در راکتور پایلوت بعد از 60 دقیقه از انجام فرایند حذف رنگ و COD به ترتیب 87 درصد و 59 درصد به‌دست آمد. مطالعات سینتیکی بر اساس حذف رنگ و COD نشان داد که در هر دو راکتور آزمایشگاهی و پایلوت سینتیک فرایند از مرتبه صفر پیروی می‌کند. The electrochemical oxidation process was used for the degradation of Acid Brown 14 in both bench and pilot scale reactors. The bench scale one with a working volume of 0.5 L was equipped with platinum plate used as the anode and stainless steel (SS-304) plates as the cathode. The pilot scale reactor had a volume of 9 L and was equipped with SS-304 plates used as both the anode and the cathode. Experiments were run using these reactors to investigate the two parameters of energy consumption and anode efficiency. The bench scale reactor was capable of removing 92% and 36% of the dye and COD, respectively, after 18 min of operation. The pilot scale reactor, however, was capable of removing 87% and 59% of the dye and the COD content, respectively, after 60 min of operation. The kinetic study of both the bench and pilot reactors for dye and COD removals showed that both processes followed a zero order kinetic. 1. Basiri Parsa, J., Rezaei, M., and Soleymani, A.R. (2009). “Electrochemical oxidation of an azo dye in aqueous media investigation of operational parameters and kinetics.” J. Hazard. Mater., 168, 997-1003. 3. Feng, C., Sugiura, N., Shimada, S., and Maekawa, T.(2003). “Development of a high performance electrochemical wastewater treatment system.” J. Hazard. Mater.,103, 65-78. 4. Panizza, M., and Cerisola, G. (2006). “Olive mill wastewater treatment by anodic oxidation with parallel plate electrodes.” Water Res., 40, 1179-1184. 5. Mohan, N., Balasubramanian, N., and Basha, C.A. (2007). “Electrochemical oxidation of textile wastewater and its reuse.” J. Hazard. Mater.,147, 644-651. 6. Deng, Y., and Englehardt, J.D. (2007). “Electrochemical oxidation for landfill leachate treatment.” Waste Manage., 27, 380-388. 7. Arapoglou, D., Vlyssides, A., Israilides, C., Zorpas, A., and Karlis, P. (2003). “Detoxification of methyl-parathion pesticide in aqueous solutions by electrochemical oxidation.” J. Hazard. Mater., 98, 191-199. 8. Vlyssides, A.G., Papaioannou, D., Loizidoy, M., Karlis, P.K., and Zorpas, A.A. (2000). “Testing an electrochemical method for treatment of textile dye wastewater.” Waste Manage., 20, 569-574. 9. Oturan, M.A., Peiroten, J., Chartrin, P., and Acher, A.J. (2000). “Complete destruction of p-nitrophenol in aqueous medium by electro-fenton method.” Environ. Sci. Technol., 34, 3474-3479. 10. Manisankar, P., Rani, C., and Viswanathan, S. (2004). “Effect of halides in the electrochemical treatment of distillery effluent.”Chemosphere, 57, 961-966. 11. Parsa, J.B., Vahidian, H.R., Soleymani, A., and Abbasi, M. (2011). “Removal of acid brown 14 in aqueous media by electrocoagulation: Optimization parameters and minimizing of energy consumption.” Desalination, 278, 295-302. 12. Jiang, J.-Q., Graham, N., André, C., Kelsall, G.H., and Brandon, N. (2002). “Laboratory study of electro-coagulation–flotation for water treatment.” Water Res., 36, 4064-4078. 13. APHA. (1997). Standard method for the examinationof water and wastewater, 17th Ed., USA. 14. Vlyssides, A., Karlis, P., Rori, N., and Zorpas, A.(2002). “Electrochemical treatment in relation to pH of domestic wastewater using Ti/Pt electrodes.” J. Hazard. Mater., 95, 215-226. 15. Muthukumar, M., Karuppiah, M.T., and Raju, G.B. (2007). “Electrochemical removal of CI Acid orange 10 from aqueous solutions.” Sep. Purif. Technol., 55, 198-205. 16. Costa, C.R., Montilla, F., Moralln, E., and Olivi, P. (2009). “Electrochemical oxidation of acid black 210 dye on the boron-doped diamond electrode in the presence of phosphate ions: Effect of current density, pH, and chloride ions.” Electrochim. Acta, 54, 7048-7055 . 17. Morris, J.C. (1966) “The acid ionization constant of HOCl from 5 to 35.” J. Phys. Chem.,70, 3798-3805.